Juggling for Everyone! Paolo Garbanzo, jester of Muncaster castle in England, will astound and entertain you with his juggling skills He will also demonstrate the basics of juggling and give you a chance to get hands on! No experience necessary. Paul Garbanzo Paul "Garbanzo" Hudert grew up in Richmond VA and juggled up and down the east coast for several years until he went to live in San Francisco in 1999. He quickly joined the juggling scene at Pier 39 and auditioned for an opening with his juggling heroes The Flying Karamazov Brothers. Getting the role as "Misha Karamazov" he toured with them for two years before returning to his own works and collaborations. In 2003 he taught at FLIC, the circus school in Turin, Italy, which started him touring throughout Europe. in 2007 he won the International Jester Competition in Muncaster, England, making him the only American to win, thus being the only American Jester of a European castle. 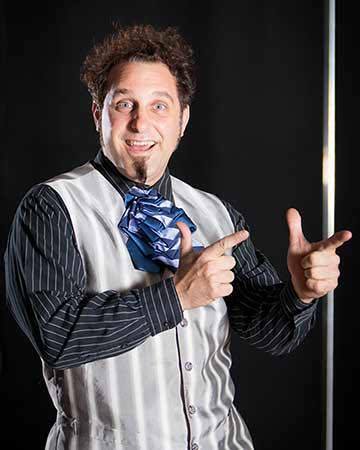 Traveling on the renaissance festival circuit, the European festival circuit, and performing in the cabaret and burlesque world, Paul has years of performance experience and showmanship to add to his juggling abilities. In 2012 he married a Lanesville girl and is happy to be visiting Gloucester.